From noted Six Sigma consultant and author George Eckes, Six Sigma for Everyone explains the underpinnings of the revolutionary quality assurance methodology, offers in-depth examples, and outlines the impact and desired end result of implementation. 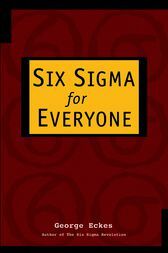 Whereas, most Six Sigma books are written for executives and practitioners of Six Sigma and tend to be overly technical or strategically focused, this book is written specifically for employees of organizations thinking about or already attempting implementation. George Eckes (Superior, CO) is founder, President, and CEO of Eckes & Associates, Inc., a Colorado-based consulting group specializing in results driven by continuous improvement, Six Sigma training and implementation, organizational development, and change management. Among his clients in the United States, Asia, Europe, and Mexico are Volvo Trucks North America, Honeywell, Wells Fargo, and General Electric. He is also the author of Six Sigma Team Dynamics (Wiley: 0-471-22277-1), Making Six Sigma Last (Wiley: 0-471-41548-0), and The Six Sigma Revolution (Wiley: 0-471-38822-X). GEORGE ECKES is founder, President, and CEO of Eckes & Associates, Inc., a Colorado-based consulting group specializing in results-driven continuous improvement, Six Sigma training and implementation, organizational development, and change management. EAI217;s recent clients include JPMorgan Chase, Wells Fargo, Cisco, and General Electric, among others. Eckes is also the author of The Six Sigma Revolution, Making Six Sigma Last, and Six Sigma Team Dynamics, all from Wiley. Visit his Web site at www.georgeeckes.com.